With the number one position earning 33 percent of all traffic on Google, it’s essential that your business learns how to rank higher on Google. If not, you risk losing valuable leads and clients, which impacts your bottom line in big ways. The best plan to improve your ranking on Google starts with a website audit. It offers immense value to your team, as it provides insight into your current search engine optimization (SEO) strategy. With the results of your audit, you can see where you excel and where you need to improve. If you’re looking for a quick summary of your website’s status, you can also use a free SEO audit tool. This tool will cover the points mentioned above, as well as provide an overall score and recommendations for improving your website’s SEO strategy. A critical focus of your website audit is your website’s speed — it impacts the experience of your users, as well as your ranking in Google search results. As a result, it’s essential that you increase the speed of your website. In addition to improving your Google search ranking, a faster website can also boost your conversion rates and time on site. That can lead to more revenue for your company, which can increase your competitive edge in the industry. For some of these changes, such as merging your CSS files, you’ll need to collaborate with your web design or web development team. Other updates, such as compressing your website’s images, is a task you can do with a tool like kraken.io. As a search engine, Google loves fresh content. It shows that your website’s not only up-to-date but also relevant to users — that can help content across your website, from service pages to blog posts, rank higher on Google. To deliver fresh content to Google, you’ll want to create a content calendar. You can build this on a monthly, quarterly, or annual basis. In most cases, a monthly calendar is ideal because it focuses on publishing content that’s relevant to users at this moment. If you build an annual content calendar, allow yourself some flexibility. Title tag: In search results, one of the first things users see is your title tag. This is a 60-character tag that serves as the title of your webpages. It tells users what your webpage is about, from learning how to rank higher in Google results to discovering why title tags matter. Meta description: The next thing users notice in search results is your meta description. This is a 160-character description of your webpage. It expands on your title tag, providing details that encourage users to click on your listing. An example of a title tag — outlined in purple — and meta description — outlined in orange — is below. Optimize your metadata for Google by including your exact keyword in your title tag and meta description. 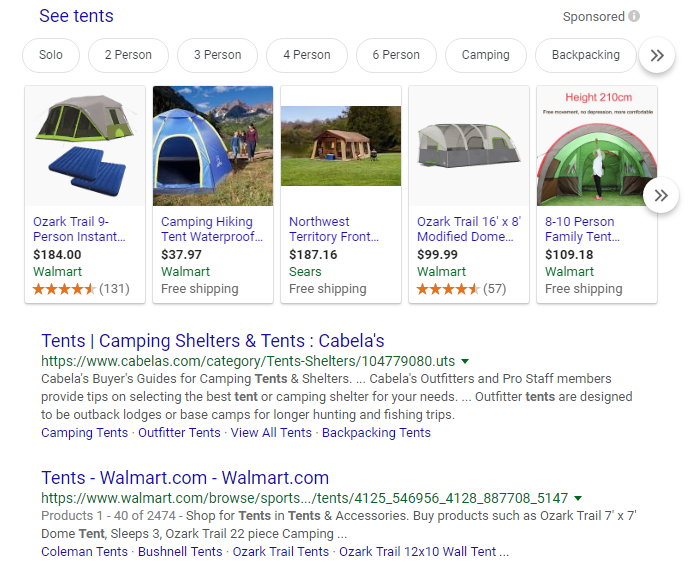 While Google doesn’t use meta descriptions as a ranking factor, they should still feature your exact keyword, as it’ll appear bolded for users. That can encourage them to click on your website. As one of the biggest ranking factors, link building dominates SEO strategies. From Google’s perspective, it’s a sign of trust when a website links to another external site — especially when that website has a strong backlink profile. While your content may not become a viral hit, if it’s original and share-worthy, you can expect it to gain traction within your industry. That can lead to links from trusted industry websites, as well as mentions on social media. Those actions send a positive sign to Google, which can boost your rankings in search results. While ambitious, many businesses new to SEO focus on short-tail keywords in their SEO strategy. These keywords offer a high search volume, but they encompass a wide variety of intents. Take the keyword, “tent,” for instance. People searching for short-tail keywords aren’t looking to make a purchase either. They’re often researching their options — or, in some cases, looking for information on a product they already own, such as how to repair a tent. Plus, you’re competing against brand names when it comes to short-tail keywords. In comparison, a long-tail keyword decreases the number of companies you’re competing against. It also provides you direct access to an audience that knows what they want, whether it’s a tent for a wedding or a tent for a group of kids. That’s why you want to target long-tail keywords. These are keywords that feature three to four phrases, as well as a lower search volume and cost-per-click (CPC). To find long-tail keywords, you can use tools like Answer the Public and Ubersuggest. From keyword research to SEO audits, your business has access to a slew of tools for improving your ranking in Google search results. All you need to do is set aside the time to analyze your website, develop your strategy, and launch your campaign to earn the number one spot in search results.